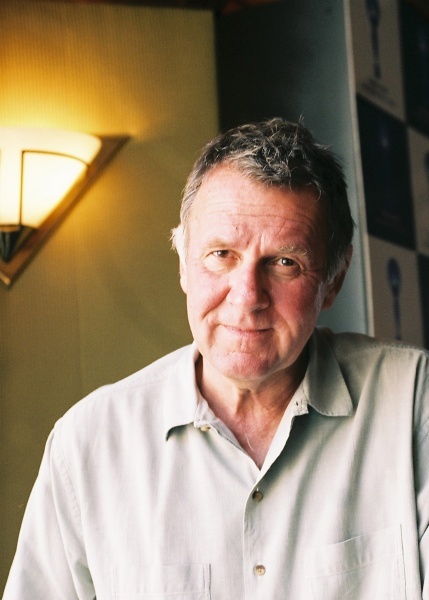 Thomas Geoffrey “Tom” Wilkinson, Jr. is Golden Globe and Primetime Emmy Awards winning actor, born on 5th February 1948 in Wharfedale, Yorkshire, England, UK. He is best known for his roles in “Martin Chuzzlewit” (1994), “The Full Monty” (1997) and the role of Benjamin Franklin in miniseries “John Adams” (2008). Have you ever wondered how rich Tom Wilkinson is? According to sources it has been estimated that Tom’s overall net worth is $12 million. Wilkinson has earned this wealth thanks to his extraordinary acting talent, and so an impressive list of roles he played during his career. The numerous awards and honors he received only added to his total net worth. Wilkinson was born in West Yorkshire, England, but moved to Canada with his family when he was four years old. There he spent a part of his childhood before returning to England where his parents started running a pub. At school, Tom’s behavior was considered restless and problematic, and he was therefore introduced to the theater, in order to keep him occupied. This led to Tom enrolling at London’s Royal Academy of Dramatic Art after finishing his studies at Kent University. After graduating in the early ‘80s, Wilkinson began performing at the Nottingham Playhouse and joined the Royal Shakespeare Company. After some time spent on stage, Wilkinson turned to television and got his debut role in TV series “First Among Equals” (1986). However, his first more notable, critically acclaimed role came in 1994, when he appeared as Mr. Pecksniff in the BBC series “Martin Chuzzlewit”, for which he was nominated for a British Academy Television Award for Best Actor. During the mid ‘90s he made brief appearances in “Sense and Sensibility”(1995) and “The Ghost and the Darkness”(1996). In 1997 he became a part of the ensemble cast of “The Full Monty” hit comedy-drama film and earned a BAFTA award for his role of Gerald. This resulted in Wilkinson’s more frequent film appearances, among others in “Wilde”, “Shakespeare in Love”, “The Patriot” and others. One of his most notable roles is that of Matt Fowler in the 2001 film “In the Bedroom”, which brought him international accolades and a series of awards; he was named Best Actor of the Year by the New York Film Critics’ Circle and nominated for the Academy Award for Best Actor. Such success led to his even greater popularity and major net worth increase. In 2007 Tom portrayed an attorney with bipolar disorder in “Michael Clayton” and gained very positive reactions and comments for his acting, and a nomination for the Academy Award for Best Supporting Actor. However, his truly biggest acting success so far came in 2008 when he played Benjamin Franklin in the HBO mini-series “John Adams”. This role brought him an Emmy Award and a Golden Globe Award as well as a Screen Actors’ Guild Award nomination. Some of his more recent activity includes his role of a CIA agent in “The Ghost Writer” (2010) by Roman Polanski. A year later he portrayed Joseph P. Kennedy Sr. in the TV series “The Kennedys”, a role which earned him a nomination for a Primetime Emmy Award for Outstanding Supporting Actor in a Miniseries or a Movie. Wilkinson is currently involved in four movies set for release in 2016 and 2017. When it comes to his personal life, Tom lives in London with his wife Diana Hardcastle, who is also an actress and played the role of his wife in “The Kennedys”. The couple have two children. In July 2001, Wilkinson received a “Doctor of Letters” honorary degree from the University of Kent, and four years later he was named an “Officer of the Order of the British Empire”(OBE) for his contribution to Drama. Parents Marjorie Wilkinson, Thomas Wilkinson, Sr.
1 Because when you decide to do a script, you don't think, "Oh, I haven't a clue how to do that. "Ooh, let's do that." I don't... No. If I read something and think, "I can do that," that's the job I'll do. If I look at something and think, "How would I begin to do that?" I'm not an actor who responds well to a challenge. 2 [on deciding which roles to take]: "You just follow your nose. You ask those simple really instinctive questions like you know: Can I shine in this role?, Can I do this role better than anybody in the world?, Is there something in it that I recognize?... Its really not to do with the money, or the director, or the other members of the cast. The first simple thing is: Am I going to enjoy playing this character?... Its a purely instinctive decision." 3 Surprise is perhaps the storyteller's greatest weapon. 4 I'm temperamentally suited to the business of acting. I'm quite fatalistic. If it's not happening, it's not happening, and there's very little you can do. 5 All good actors are easy to work with. It's the ones that aren't very good who tend to be very difficult. 6 There are no acting challenges in a good script, only in a bad script. 1 As of 2015, has appeared in eight films that were nominated for the Best Picture Oscar: In the Name of the Father (1993), Sense and Sensibility (1995), The Full Monty (1997), Shakespeare in Love (1998), In the Bedroom (2001), Michael Clayton (2007), Selma (2014) and The Grand Budapest Hotel (2014). Of those, Shakespeare in Love (1998) is a winner in the category. 3 Is the only actor nominated for two Golden Globes on the same year for portraying two American politicians: "Benjamin Franklin" (John Adams (2008)) and James Baker III (Recount (2008)), winning for John Adams (2008). Both of these miniseries/television movie were produced by HBO. 4 Has played both a villain and hero of the American Revolution: Gen. Lord Charles Cornwallis in The Patriot (2000) and Benjamin Franklin in John Adams (2008). 5 He was awarded the O.B.E. (Officer of the order of the British Empire) in the 2005 Queen's New Years Honours List for his services to Drama. 6 Was offered a role in the Lord of the Rings trilogy, but didn't like the prospect of a year long production keeping him away from his family. 7 Became an Associate Member of RADA. 8 He was awarded the 1988 London Critics Circle Theatre Award (Drama Theatre Award) for Best Actor for his performance in An Enemy of the People. 9 He was awarded the 1986 London Critics Circle Theatre Award (Drama Theatre Award) for Best Supporting Actor for his performance in Ghosts. 10 Has two children: Alice, born in 1989 and Molly, born in 1992. 11 He has performed at the Oxford Playhouse, the Royal Shakespeare Company, the National Theatre and on the stage at London's West End. 12 Attended the Royal Academy of Dramatic Arts. 13 Graduated from the University of Kent at Canterbury with a degree in English and American Literature. Was awarded an Honorary Doctor of Letters degree by the University in 2001. The Kennedys 2011 TV Mini-Series Joe Kennedy Sr.
Jackboots on Whitehall 2010 performer: "Jerusalem"
Another Life 2001 performer: "Silly Billy Willy"
Priest 1994 performer: "GREEN GREEN GRASS OF HOME"